Just pop the DVD into your player each night of December, then gather around and watch the fun. 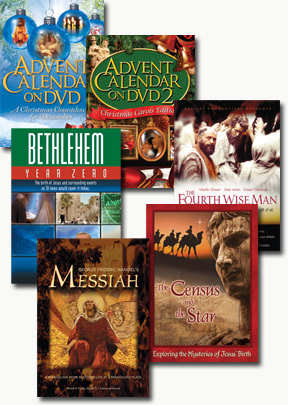 Make this Christmas season special with the Advent Calendar on DVD. Here are 25 brief reflections on treasured songs and carols for the entire family to enjoy during Advent. Explore the wonders of Bethlehem revealed in the stories of treasured songs and enjoy new arrangements of traditional Christmas favorites by award-winning composer Steven Bias. Your spirit will sing with the inspiration and fun of Advent Calendar 2 on DVD: Christmas Carols Edition. Songs include: "Angels We Have Heard on High," "Away in a Manger," "Deck the Halls," "Jingle Bells," "Joy to the World," "O Holy Night," "Up on the Housetop," and many more! 25 segments, 115 minutes total. This DVD production will become a favorite in your Easter and Christmas Music Collections. Explore the mysterious circumstances of Christ’s birth in this captivating look at the first Christmas. Joseph and Mary traveled to Bethlehem by order of the Emperor, Augustus Caesar. This census has long confounded historians seeking to reconcile the Bible with recorded history. The evidence to address that is both intriguing and insightful. The mysteries continue when a star appears to announce the birth of the King of the Jews. What was the star? What did it look like? When did it appear? Foreign Magi, or Wise Men, saw the star and followed it to Jerusalem and Bethlehem seeking Jesus. These little-understood figures were among the first to discover Jesus in what was surely a life-changing, as well as history-making, event. Explore the star as the Magi did, following it to better understand Christmas. Trace what the Magi did as they gazed into the night sky those thousands of years ago. Find answers to these questions and more... What really happened on the first Christmas? This enlightening presentation provides a greater understanding and new appreciation of the world into which Jesus was born.